McLendon-Covey has also made waves as the overbearing, feather-haired mom on ABC’s charming sitcom The Goldbergs. As Beverly, she’s fiercely devoted to her kids, but not above embarrassing them for the fun of it. She recently took on another caretaker role, in Larry Charles’ Army Of One. The film, which is based on real-life Osama Bin Laden hunter Gary Faulkner, sees McLendon-Covey play Marci Mitchell, a reformed hottie and adoptive mother to her niece with cerebral palsy. Marci ends up minding Gary (Nicolas Cage) just as much as her niece, but she doesn’t seem to mind. 1. What is a question you wish an interviewer would ask you? 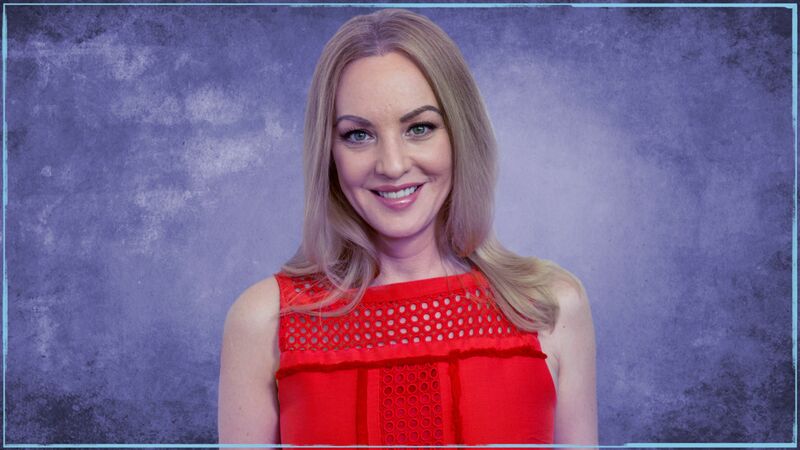 Wendi McLendon-Covey: I don’t think I really have an answer for that. I’m really not sure. The A.V. Club: We could always come back to it. Or, conversely, what’s a question you get asked that you’d rather the interviewer just skip? WMC: I get asked about the weather a lot. I’m surprised at how often that will come up in a conversation when there is actually a short amount of time to talk. [Interviewers should avoid asking] anything weight-related when it comes to me. I don’t care. I don’t weigh myself. I’m just sick of the whole thing, and I think we as a nation have become very boring. And really? That’s another thing you want to talk about? That’s right up with the weather or traffic patterns. I couldn’t care less. AVC: That’s an excellent caveat. WMC: Oh gosh, I saw the biggest, craziest species of cat on some YouTube video just recently. I thought I was hallucinating. Some giant creature that looked like something from The NeverEnding Story. And I couldn’t believe it was real. So I would like to ride that to work, all the way into Sony from Long Beach. It would take hours. AVC: Yeah, because even if it’s a big cat, it would still have cat tendencies. It wouldn’t want to head straight to work, despite what your schedule may be. WMC: Yeah, it would probably want to stop and smell things. And I would let it do that if that’s what it needed. 3. What movie have you watched the most? WMC: I will always stop for Ferris Bueller’s Day Off. And always for The Breakfast Club. And also 9 To 5. AVC: Well, those are all great, especially Ferris Bueller. With that one, you’re hitting us right at home here in Chicago. WMC: Yeah, come on now. AVC: People around here have been pretty pumped about that other significant Chicago thing that happened recently. WMC: Oh, yeah, that other thing that’s so important to our nation’s history. Yeah, that’s major. WMC: I was never quite sure as a kid whether or not people on a live television show could see through the television to your house. So I believed that—probably not totally but halfway—until junior high. And the reason for that was because in kindergarten, we were all as a class watching some show on TV. And I was fidgeting, so instead of sitting on a floor, I was sitting in a chair. And I was being really grumpy about it, and a lady on a TV said, “I think someone’s sitting on a chair and they’re not using good posture.” And I was the only one sitting in a chair not using good posture. It freaked me out. I straightened up. Everybody looked at me, and I was mortified. So from then on, I was like, “Can they see us? I don’t know. I better have all my clothes on. I better not do anything stupid. I better not walk around in my underwear.” That freaked me out. AVC: So would you then just make sure the TV was off when you weren’t watching it? WMC: Oh, absolutely. It’s off. Especially if it was a live TV show like the news or Regis—you know, because he had a show way back then. 5. What’s the most interesting thing you’ve heard about yourself that isn’t true? WMC: My mom forwarded this to me a couple years ago, and she was very upset and ready to go on the warpath. It was a plastic surgery thing. Like, “Oh, you can tell she’s had plastic surgery here, here, and here,” and it’s like, “No, I haven’t. You’re not good at what you do. I’m sorry.” It was one of those hack doctors that was like, “If you look at this person, you can tell that she’s had a chin implant and all these things.” Dear God. AVC: That’s about as productive as asking about the weather. They could at least try to find something more interesting to focus on. WMC: Yeah, but the clickbait is there. It was just one of those things. You’re always going to find something like that if you go looking for it, so I don’t know what to tell you. My mom said, “Well, aren’t you going to try to defend yourself?” I said no. I can’t do anything about that. But she would like to. 6. What’s the weirdest thing you have ever eaten? WMC: I have a lot of food allergies, but I try to be a good guest. I’ll try everything if I have to. I was in Japan. This was like 20 years ago. And we were taken out to a very expensive traditional dinner, and someone put octopus in front of me and I had to try it. And I didn’t throw up, so I consider that a personal victory. It’s just not something I eat, and it’s not something I want to look at on a plate. I don’t even do calamari. AVC: Yeah, I’m right there with you. For me, it’s a texture thing. AVC: And it doesn’t really taste like anything. WMC: Yeah, so when I tried it, I was trying to be a good guest. I took one bite, but I didn’t finish it. WMC: The first concert was Sparks. This was back in the ’80s. And I don’t know how old you are or if you were alive in the ’80s, but they sang “Cool Places” with Jane Wiedlin. It was kind of a fun band. I really had to do a lot of whining and homework-finishing to be allowed to go, and it was fun. AVC: Oh, sure. They played Chicago almost exactly three years ago. They had a song on the Valley Girl soundtrack. AVC: That’s actually a pretty cool first concert. But it’s probably not something Beverly would condone. WMC: I got to go to Iraq three times to entertain the troops. I think it was 2009, 2010, 2011. Something like that. For New Year’s. For a week, we went to Kuwait and Iraq and went around to these little tiny bases that never get any entertainment and do improv shows. And sometimes we were good, sometimes we were terrible. And sometimes you were in a mess hall entertaining at 9 a.m., and it was weird. It felt like you were in someone’s living room or something. It was just too close. You weren’t in a real entertainment venue. So there was no stage production or anything. But it was fun. It was interesting to communicate with some of the troops that we met doing that. And I get asked every year to go back, but I haven’t been able to, which is kind of a bummer for me because I liked going. But I was so exhausted after the trips, that I wouldn’t be able to do that and then go back to work on The Goldbergs. So I haven’t been able to go back. But what a fun opportunity and so interesting to see what the news doesn’t show you. That was really fun. AVC: That just proves that no one got out of the ’80s or ’90s unscathed. WMC: I don’t think so. [Pauses.] No. Sorry! AVC: Hey, it’s okay. That one’s basically a yes-or-no question. WMC: I was at the Country Music Awards last night, and I got to meet Olivia Newton-John. That was a big deal. AVC: Yeah, that was on your Twitter feed. WMC: I also met Tom Cruise but didn’t even realize it. It was backstage at the Oscars, and I was trying to get my shoes off my swollen feet. And I was having trouble, and someone came up to me and said, “Here, let me help you.” And he kind of steadied my arm, and I said thanks. I yanked off my shoes and I just said thank you, and I didn’t really look at who it was and it was Tom Cruise. So we’ll see if I ever meet him again. But that was very nice of him. AVC: What do you want to ask the next person, not knowing who it is? WMC: What’s the worst career advice you’ve ever gotten?